We LOVE the alpaca lifestyle and want to help others achieve their goals. Experienced mentoring can help you save time and (and make) money. Mentoring includes assistance with everything from initial farm design to sales and marketing strategies and everything in between. These online resources are just an example of the free consulting we provide all clients. 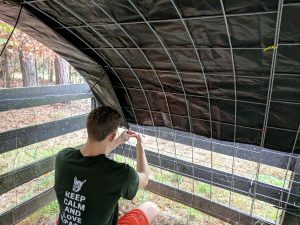 Building a shelter for your alpaca, or any other farm animal, is one of the most important investments you'll ever make. However, not every farmer has the budget for the fanciest barn money can buy. I've built animal shelters that cost less than $150, less than $15k, and less than $50k. Each had a specific purpose and was cost appropriate. Here I'll detail the three types of animal shelters I've built, and how much each one cost. Every farmer will tell you that you can't build too much barn. You'll always wish you had made it bigger. cold winter months. These guys were designed for cold weather. 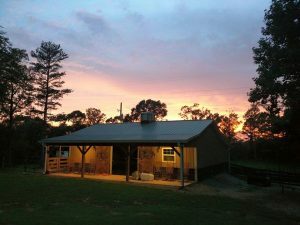 That means our animal shelters are built to provide shade and airflow. 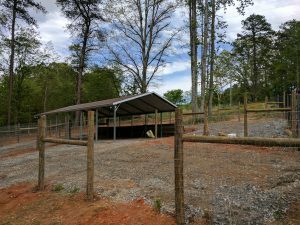 Many alpaca farms in the south will have barns that are open on all sides. We also use fans in the summer to help keep alpacas cool and our barns typically have electrical for those fans. 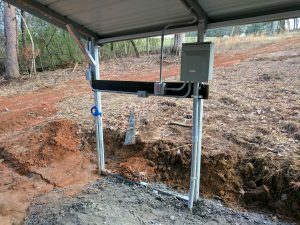 Correctly burying electrical to your barn will add significant expense. 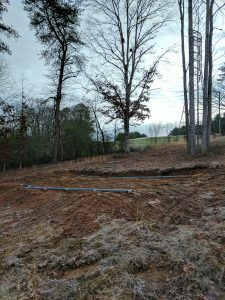 We also run water to our barns and want them built with minimal ongoing maintenance. The first barn we built was crafted by David Charity of Arbor Wood Products. 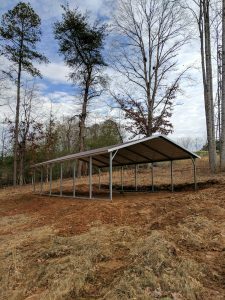 He traveled the Southeast assembling metal building kits that are built like pole barns. There are many companies that do this (such as Armour Metals). Some use pre-built metal trusses while others use wood trusses. We specifically wanted the wood trusses so we could box the eaves to match our house and it would be easier to build-onto later. David's work on this barn came in at 26k. 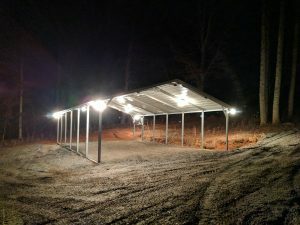 Our electrician ran power and water to the barn, installed the 2 Nelson automatic waterers, installed farm faucet, framed the barn office, and installed all lighting and electrical. That work was added substantially to the finished price. 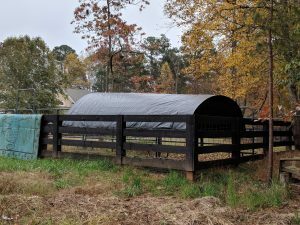 For our second barn we just needed a shelter for the "boys". They're not too fancy. They just need to get out of the rain and sun. 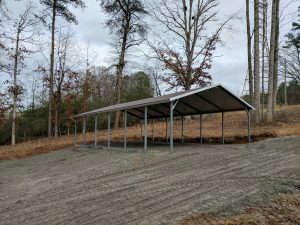 For this shelter we used a metal carport with "boxed eaves". The 18'x36' model can often be purchased installed for under $2000. 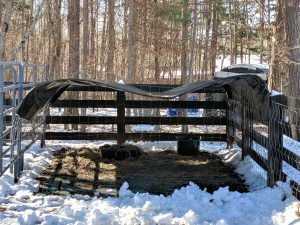 When we needed a temporary shelter for quarantine, I used cattle panels from Tractor Supply and a tarp to make a hoop run-in shed. It's great for its ability to handle rough weather because it's flexible and moves. It's also a very affordable shelter. Basically most are built by driving two parallel rows of metal t-posts (3-4 T-posts for each row) into the ground with 5-10 feet between the rows, depending on the desired arch. 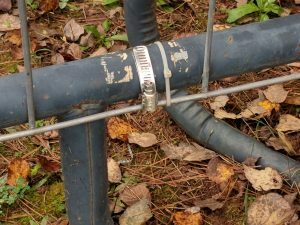 In my case, instead of t-posts I used an existing fence-line and metal corral panels. You take the 16 foot cattle panel and bend it in an arch between the two rows of supports. 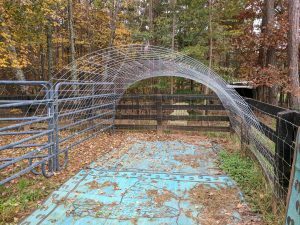 Since cattle panels are 4' tall, I strapped 3 of them together making a shelter that is 12' deep. 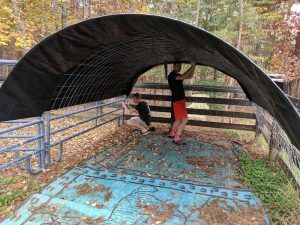 After building the arch, attach a good tarp on top and you have a shelter. For our shelter I used 3 cattle panels at $20/ea and a good tarp so that the total cost of this shelter was around $100.